Barra: Run common led to uncommon success. 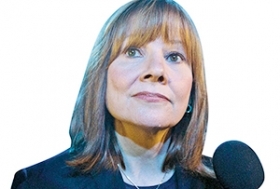 In Road to Power: How GM's Mary Barra Shattered the Glass Ceiling, a new book by Bloomberg reporter Laura Colby, the author suggests that a key person in Barra's career rise was Ken Varisco, her boss in the mid-1990s. Varisco was head of General Motors' manufacturing staff, and Barra was a senior staff engineer for what was then the Chevy-Pontiac-Canada Group. Barra came to Varisco's attention when he heard a striking presentation she gave at GM's tech center in Warren, Mich.
Varisco made Barra manager of manufacturing planning for the midsize car division. One day, Barra walked into her boss's office, noticed he was upset and asked what was bothering him. It turned out Varisco was under pressure from Don Hackworth, group manufacturing vice preident, to standardize new product launches at GM assembly plants. Varisco explained the challenge to Barra -- he had to get the plants to run common. "So let's do that," she told Varisco. He assigned Barra to work on the system and then asked her to present what had been developed to Hackworth and other executives. They approved it and Varisco pushed for a promotion for Barra, turbocharging her career. Then in 1997, at age 36, she became CEO Jack Smith's assistant -- a fast-track assignment if there ever was one.